A couple of years ago, Bushwick was just another working class neighborhood not quite like the bright Manhattan. Now, this neighborhood is fast becoming the new hip neighborhood attracting not only students looking for cheaper rent but also up and coming artists, musicians, chefs and restaurateur – all adding to an already diverse population. Hailed as the 7th coolest neighborhood in the world by Vogue Magazine in 2014, Bushwick stands out from other places in New York City. If you are on Jefferson or Troutman Streets or Saint Nicholas Avenue, you will definitely see the famed Bushwick Collective. 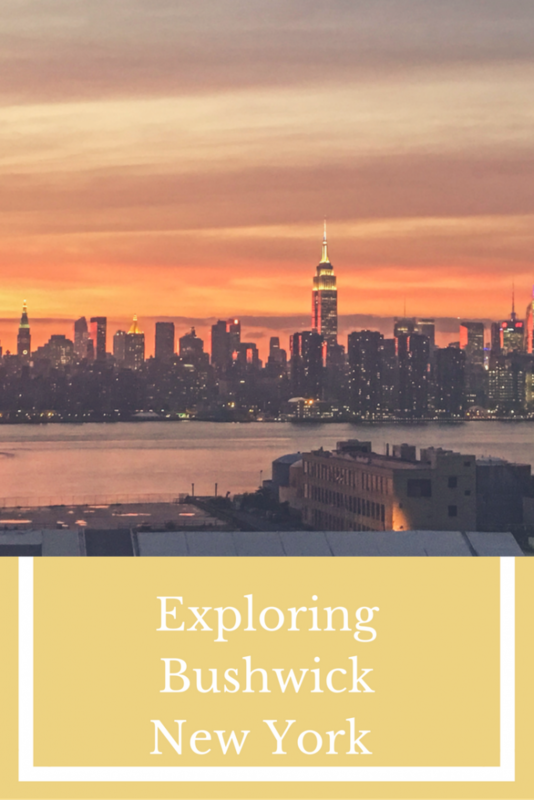 Going from Jefferson to Saint Nicholas by foot may take you roughly 30 minutes but do not worry Bushwick is not just a feast for the eyes. 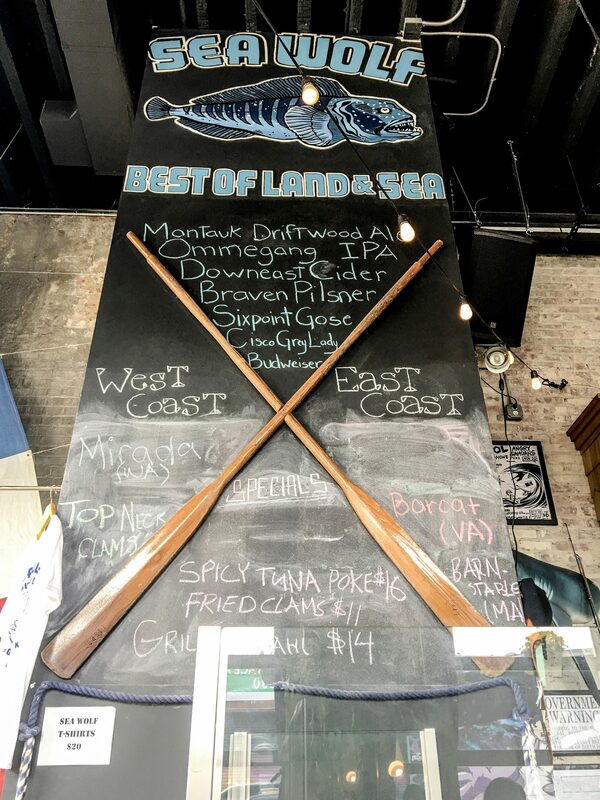 Although Troutman Street is far from the sea, the owner of the restaurant made sure to bring you that nautical feel with all the sea theme décor and the sidewalk seating. Of course, they have all sorts of sea food. We were still full at this time so we just had pinacolada while enjoying the beach-like ambiance. In the mood for some Japanese food? Bushwick’s got you covered with Momo Sushi Shack. 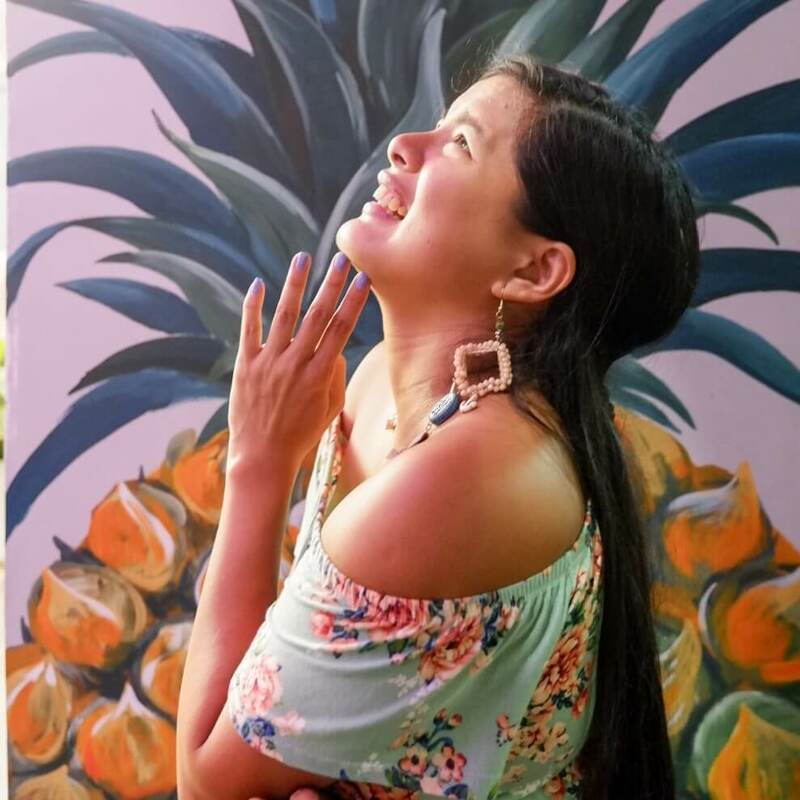 Do not miss this old warehouse turned restaurant on Bogart St. Like most restaurants and art galleries in this neighborhood, the founders of Momo saw their restaurant rise from a 50 year old abandoned building. 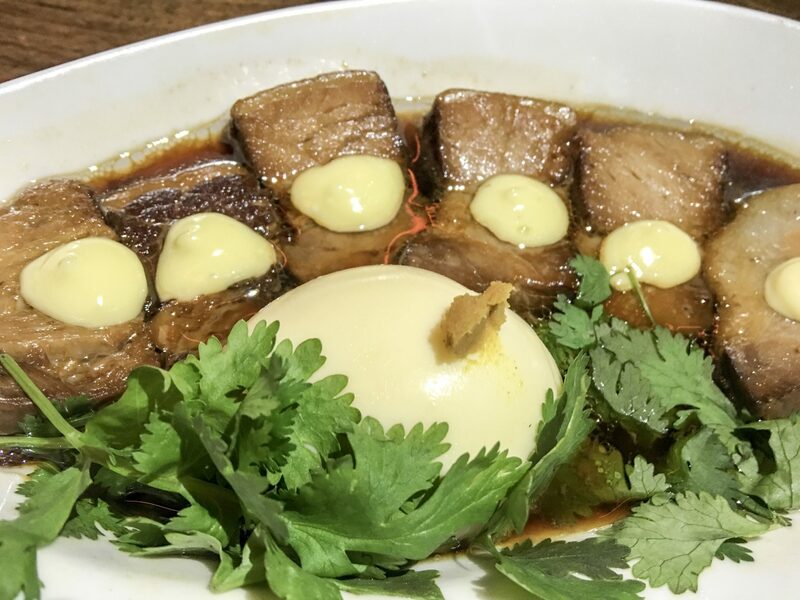 We tried the restaurant’s top seller pork belly and a spicy tuna bomb and it was really satisfying. Momo has a reputation of using locally grown produce, healthy menu and the cleanest kitchen in the area. A few steps from Momo is Swallow Café. It’s hard to miss the blue bird painting on the wall outside the café and harder to resist once you smell the coffee brewing. Turn a corner from Bogart to Seigel Street and you’ll discover another treasure, a chocolate factory hiding behind mismatched furniture. 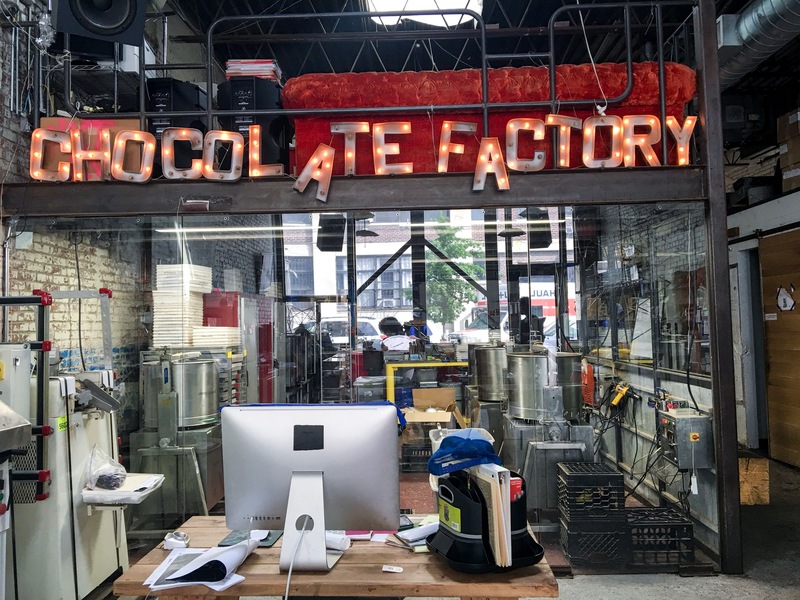 The guys here are really making chocolate in a lab, like Willy Wonka… follow a trail of cocoa beans and chocolate samples if you want to see how their chocolate is made. Oh, and you can get a free unicorn while sipping hot chocolate (if you can find it, of course). Full? Then maybe you can shop around for a bit. Oasis Collections lists Bushwick as one of the world’s best budding street style as it considers the neighborhood with the most concentrated dose of cutting edge style in all New York. Bushwick is now home to former Williamsburg thrift shop, Beacon, now at 23 Bogart Street. Not far down the street at 56 Bogart Street is Mary Meyers Friends for a more vintage inspired clothing (and some 90s style clothes) plus other lifestyle stuff like books, candles, accessories and other gift items. Go back a few blocks to Flushing Avenue and sit yourself on one of the outdoor benches, couches, and even swings and enjoy their famous burgers and drinks. If you do not enjoy sitting under trees, there are decent chairs inside as well. I tried the “Falcon Lake Incident” and “Fancy Pants Milk Punch.” Milk punch is a type of drink made from three days by boiling milk and then slowly adding fruits, spices and alcohol. Fancy Pants have pineapple, black tea, sherry and rum – its sweet and light and its super good for only $12. A few minutes’ drive to Wythe Hotel, climb your way up to the 6th floor for some drinks and a good view. 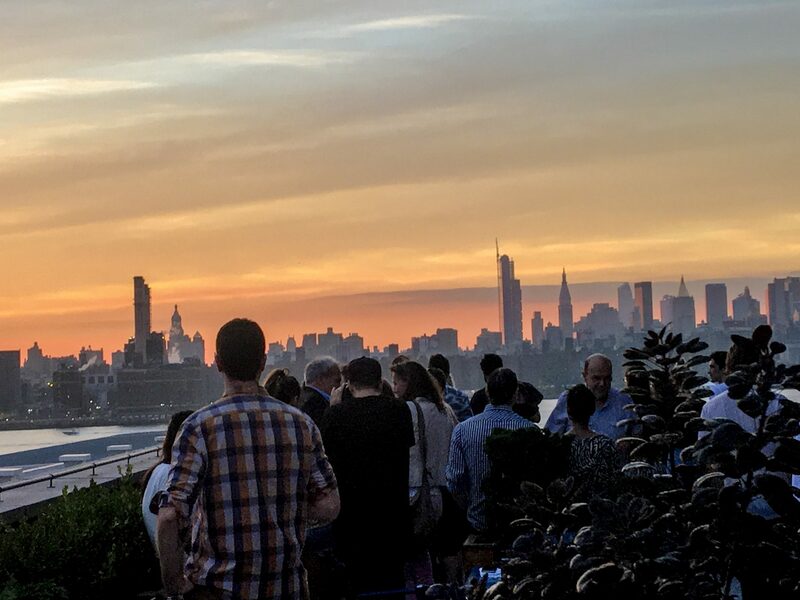 Ides Bar is still one of the best “rooftop drinking destinations.” We watched the day’s sunset here while sipping Cooper Queen for 18 and was not disappointed. Not to mention there’s no service charge. No wonder dozens of people flock here. We decided to hop to Juliette’s Restaurant for a more relaxed roof top experience. This restaurant managed to mix chic, romantic and nostalgic ambiance without overdoing the Paris theme. 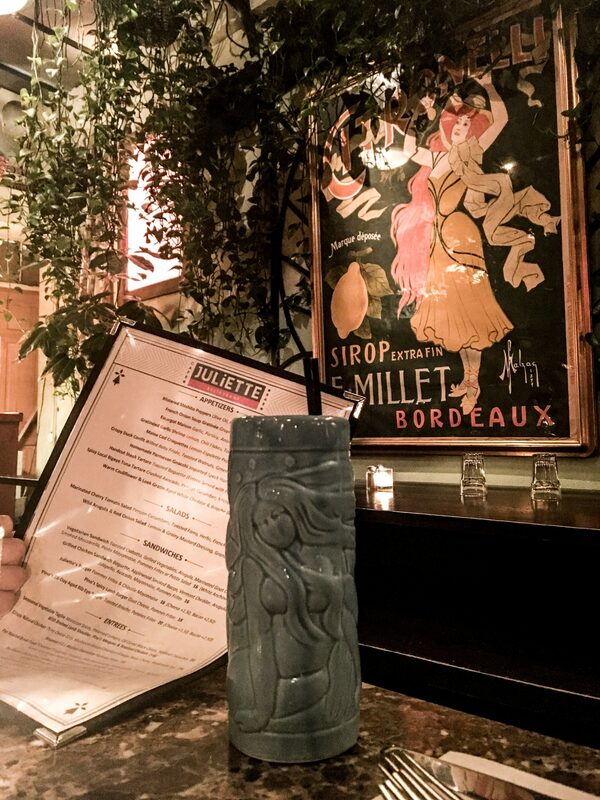 Since it’s a French bistro, we ordered Gnocchi and Iberico and a Europa drink in a totem-like cup. There are so many things to see and do in this up and coming trendy neighborhood. 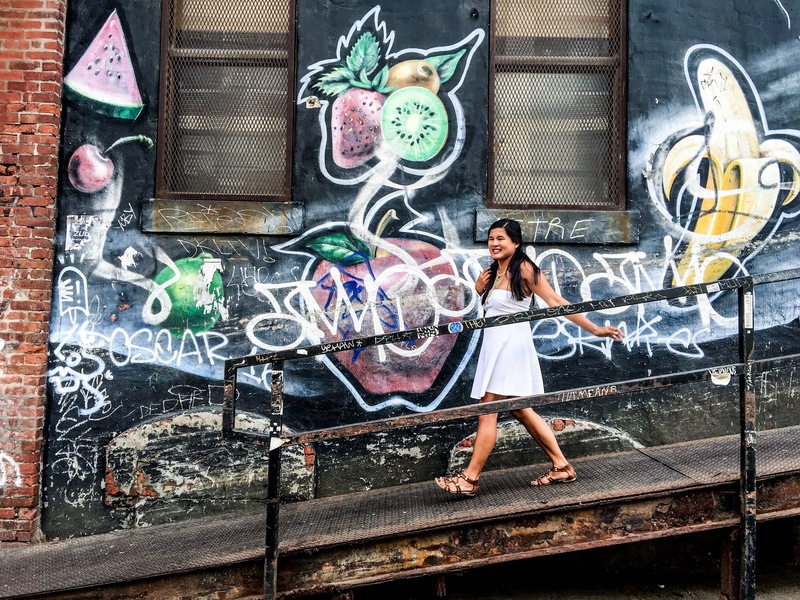 If you like artsy places or you just want to be hip, try Bushwick. That sounds like a really cool place to visit. I hope to get there someday!! The chocolate factory would be where I want to visit. I love checking out chocolate places. My kiddos and I were supposed to be in NYC right now but our plans had to change. 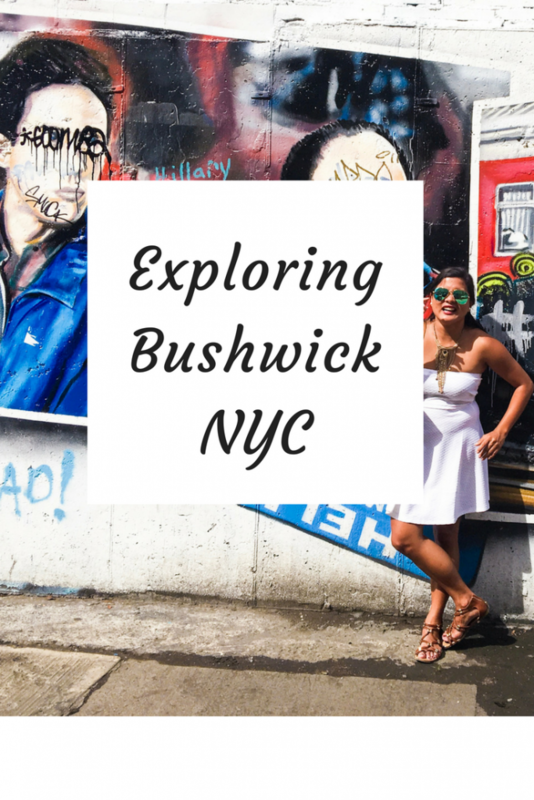 I totally want to explore Bushwick. I love thrift shopping. I’ll definitely keep this in mind for the day I finally make it to NYC, lol! I haven’t been to New to see these places but now I want to! I would probably visit the Chocolate Factory 1st! This is too cool! I’ve always wanted to visit New York so I think this neighborhood will have to be added to the must see list! Bushwick sounds like a really cool place to visit. And that food is really making me hungry right now. Wow all that seafood looks amazing. I love the signs and street art…. That chocolate factory looks brilliant! I feel like I haven’t been to NYC in so long! This inspired me to make a trip back! 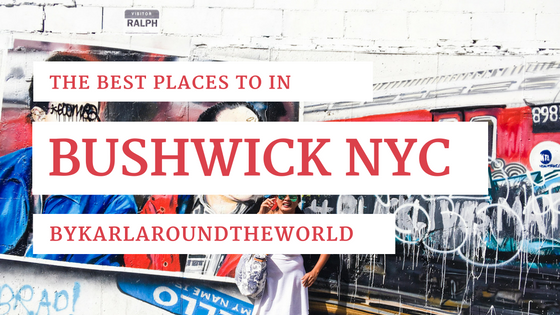 I’ve never even heard of Bushwick, but you’re right – it sure looks super cool! Next time I’m in NYC I’m checking it out! Great pics! I had no idea about this place! Thanks. I’ve been to nyc many times, but none of these places. Thanks for the awesome recommendations! First time I read about Bushwick. The place is cool with lots of unique shops/establishments. I would love to visit the chocolate factory. I have never seen one. 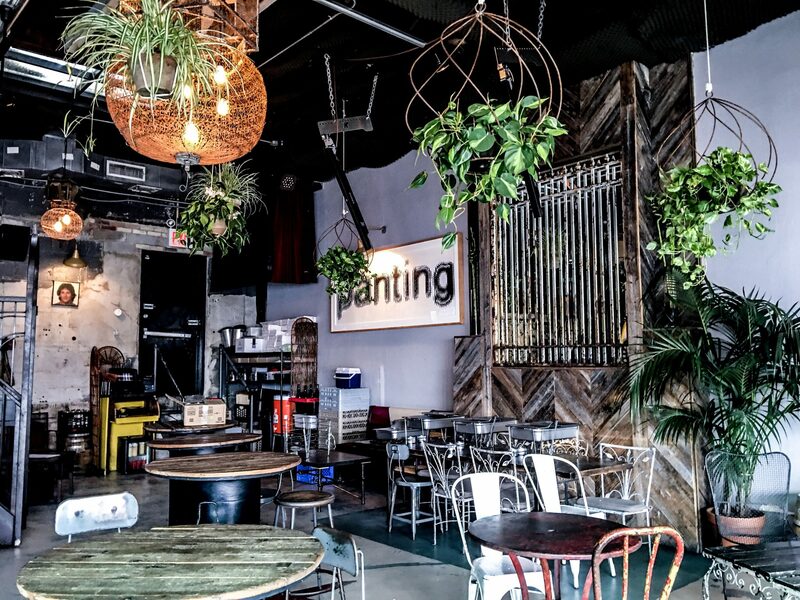 I like these bars in Bushwick, they are very interesting and artsy and have its own unique appeal. And instagrammable too. This place looks awesome. New York is my favourite place in the world. I’d love to check out those thrift shops! That Japanese food looks amazing! And I love the thrift shops. We don’t have many where I live.